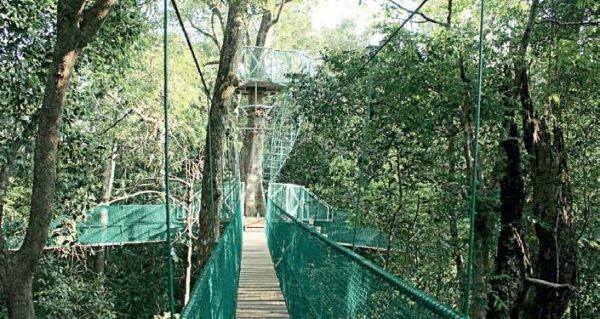 On February 18 India’s first canopy walk would be inaugurated in the Western ghats at the Kuveshi area, near Castle Rock of Uttara Kannada about 90 kms from Belagavi. However regular entries will take some more time. The project which has been developed jointly by Karnataka Tourism and Forest Departments will be thrown open for public on February 18. Forest Minister Ramanath Rai, Industries Minister R V Deshpande and Tourism Minister Priyank Kharge will be present during inauguration, sources said. First of its kind project in the country will allow a maximum of 10 people for the walk at a time and two each can stand on the different platforms there to watch the life around. Regular entries will begin only after the forest dept signs an MoU with Jungle Lodges and Resorts or Karnataka Eco-Tourism Development Board (KEDB) and this may take a few days. Forest department has proposed a fee of Rs 50 per adult and Rs 25 per child (only those above 13 years are allowed). Tariff may be revised based on the requirements of the operator who signs the MoU to run the facility. Wow. This sounds real amazing. I am from Belagavi. I am planning to go here. Is it open on all the days now? How about stay arrangements?